In 1688, the parish of St James, Piccadilly, opened an establishment for the old and infirm poor at Salter's Court (now Smith's Court). In 1721, it moved to New Street (now Ingestre Place) and continued in operation until 1748. In the Burying Ground near the Pest Field: The Building is a new spacious Brickhouse, in which there are at this time 302 Persons, of which about Fourscore are Children, and all that are able, work at spinning Jersey, Mopp Yarn, and Flax; the Jersey and Flax is wove in the House by Weavers belonging to the Family. The Women and Girls knit all the Stockings for the Poor in the House. The Men that are able Card Wool, or assist the Cook in tending the Fires, and Coppers. The Children are taught to Read, and say their Catechism at such Hours as they can belt be spar'd from Work. There are 8 Wards, viz. 4 for Women, 2 for Men, 1 for Boys, and 1 for Girls containing 18 Beds in each Ward, and at this time, the House was so full, that the Steward was oblig'd to place 9 Beds in the landing Places, at the head of the Stairs, and other like open Places, making in all above 150 Beds. There is one Ward for Lying-in-Women, into which many are brought out of the Streets to be deliver'd. Another Ward for an Infirmary, where, though it is generally full of Sick People, the Women that are well, are very officious to give all the Attendance they are able, under the direction of a diligent Matron, who has the care of all the Linnen and Woollen Apparel of the House, governs the Kitchen, &c. and with the Governour have their Eyes in every corner of the House, to see that nothing be wanting that is necessary to the sick or well, and to prevent Waste. In so large a Family, it is hardly to be expected, that proper Persons should be found among helpless People to answer all the Offices required ; but the Governour and Matron, under the direction of the Overseers, who meet every Week to inspect their Management ; generally make a Shift to fill all the under Offices of the House, out of the Poor themselves, who ought to think it a Happiness to be so employ'd, instead of Starving or begging in the Street. Originally a Charity School for Girls, set up in the Year 1725, in Burlington Gardens; built at the Charge of several private Gentlemen, and is wholly devoted to the Maintenance and Education of 40 poor Girls : where they are Taught all parts of Housewifery, that may qualify them to be good Servants ; such as Washing, Scouring, Sewing plain Work, and spinning Flax ; besides Reading and Writing. The Government of it is in the Hands of those Honourable Persons, who are pleased to support it by their own Charity, with the Assistance of some Casual Benefactions, which it is hoped may encrease, when the good Effects of this Foundation are more generally known. In 1762, the parish promoted a Local Act 'for the better Relief and Employment of the Poor' (2 Geo. 3 c.58). This put the administration of poor relief into the hands of a Board of Guardians elected from the local ratepayers. A parliamentary report of 1776 recorded that the parish of St James, Westminster, had a workhouse capable of accommodating 650 inmates — one of the largest in the country. The workhouse building was described as being constructed of brick, 146 feet long, 40 feet deep, 58 feet high, and consisting of 32 apartments. Inmates were employed at needlework, quilting, carding wool, spinning yarn, making regimentals, and winding silk. The children were occupied in reading, writing, needlework, knitting, spinning, opening horse-hair, and making lace. On the workhouse payroll were a chaplain (£20 per annum), a clerk (£40), a master (£30 and 5 per cent of the profits), matron (£21), schoolmaster (£20), schoolmistress (£10), lace mistress (£7 7s and 5 percent of the profits), cook (£10), porter, nurses, and petty servants paid weekly at the discretion of the governors. 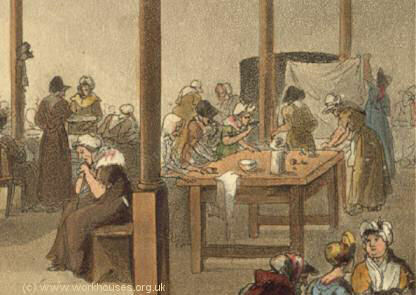 In around 1809, the Poland Street workhouse interior was the depicted by the artist and caricaturist Thomas Rowlandson. 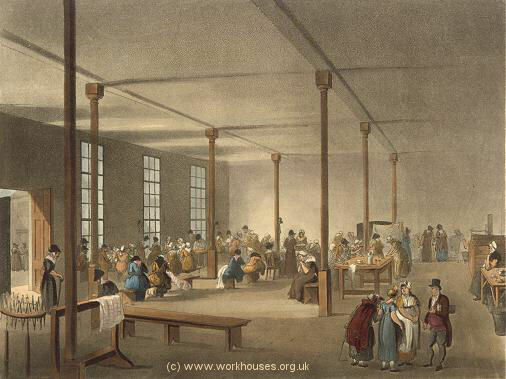 The interior of St James workhouse, 1809. 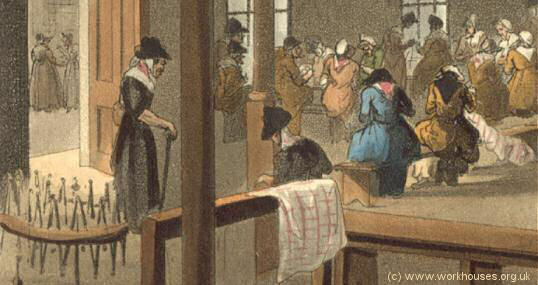 The interior of St James workhouse (detail), 1809. In 1821, the buildings were improved and extended, with a new dormitory block being added. The song St. James Infirmary Blues, which dates from at least the early 19th century, may well have been an allusion to the St James workhouse. Victorian maps of the site identify male and female infirmaries. And the song's origins — the lament of rake brought low by venereal disease — resonate well with the type of inmate who often ended up seeking medical care in a workhouse. St James' Local Act status largely exempted it from the provisions of the 1834 Poor Law Amendment Act and it continued to operate as an independent parish. By 1858, the north wing of the Poland Street workhouse was in a dangerous condition and was reconstructed to a design by Charles Lee. St James workhouse site, 1867. In 1868, St James joined with Soho to form the new Westminster Union. In 1871-2, new Union Offices were built at 49-52 Poland Street, with workhouse wards on the upper floors. In 1913, Westminster amalgamated with the Strand and St George's unions to form the City of Westminster Union. The Poland Street workhouse was then closed. In 1914, the disused building was taken over by the Metropolitan Asylums Board for the housing of wartime refugees. On September 5th, 200 Russian Jews, mostly from Antwerp, were placed there. A week later, the premises were handed over to the Jewish authorities and continued in operation as the Poland Street Institute for Jews. In 1925, the buildings were reconstructed as a garage. The site is now occupied by a multi-storey car-park. In 1851, the parish purchased a 20-acre portion of Wandsworth Common for £600. The land was used as the site of an Industrial School erected in 1851-2 to house pauper children. The building was designed by Charles Lee. In 1878, the parish sold off 14 acres of the land for £14,500. In 1884, it altered and extended the buildings which could then accommodate almost 200 children. St James' Road Industrial School. With the creation of the Westminster Union in 1868, the schools were taken over for the use of the whole union. The schools also took in fifty pauper children, under contract, from the Hampstead Union which was one of the few London workhouse authorities not to operate its own children's institution. 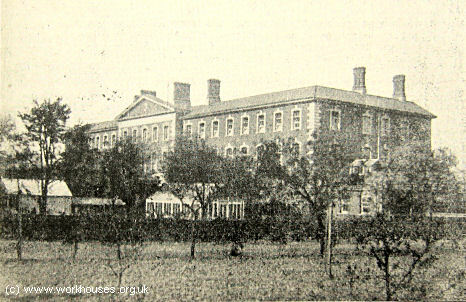 In 1904, the site was sold to the Wandsworth Union which converted the existing buildings for use as a workhouse, and erected a large new infirmary alongside. The site became St James' Hospital and continued in operation until around 1991. The buildings have now all been demolished. City of Westminster Archives Centre, 10 St Ann's Street, London SW1P 2DE. Holds parish records prior to formation of Westminster Union including: Governors and directors of the poor minutes (1767-1890, indexed from 1809); Workhouse admissions and discharges (1791-1797, 1803-1807, 1812-1814, 1819-1828, 1835, 1867 — all indexed); Workhouse death registers (1803-1818); Workhouse work books (1836-1868); Workhouse accounts (1813-1868); Register of insane poor (1849-1885 — indexed); Apprenticeship register (1848-1868); Registers of poor children at schools (1843-1869 — indexed until 1862); etc. St James workhouse holdings include: Admissions and discharges (1867-1912); Baptisms (1884-1927); Deaths (1903-13); etc. Sheffield Street receiving workhouse holdings include: Admissions and discharges (1890-1913); Creed registers (1869-1913); Births (1891-1913); Deaths (1898-1913); etc. Other holdings include: Guardians' minute books (1868-1913); Financial records (1868-1913); Staff records (1867-1912); etc.